One author recounts how the election night was received by Regent students. One chilly night, on November 8, 2016, several people waited in room 113 of Robertson Hall to watch the history of the U.S. unfold before their eyes. It was Election Day, and everyone anxiously waited to see who would become the next president of the United States. The Fox News election coverage was on the projector screen and a map of the U.S. was on a chalkboard, with someone coloring in each state with either the colors red or blue, depending on which candidate won the state. A video camera and mic were set up in the room, as one Regent student was recording an interview with another. There was food, a puzzle on the table, and pictures of each canidate on the wall, with cardboard elephants, donkeys, and American flags all around the room. A poll was taken at the party, with 19 people for Trump, two for Clinton, three for Johnson, one for McMullin, and one for Jesus. Despite the fact that Trump was in the lead at 8:56 pm, some commentators predicted that Clinton would win. Looking at the results online, it seemed like Clinton was leading in the key swing states; by 9:14 pm, however, that appeared to be flipping in some cases. The commentators said that the election was a lot closer than predicted; even the stock market was showing it, as it dropped because of the closeness of the race. The party ended at 11:00 pm, but the election was yet to be officially called. 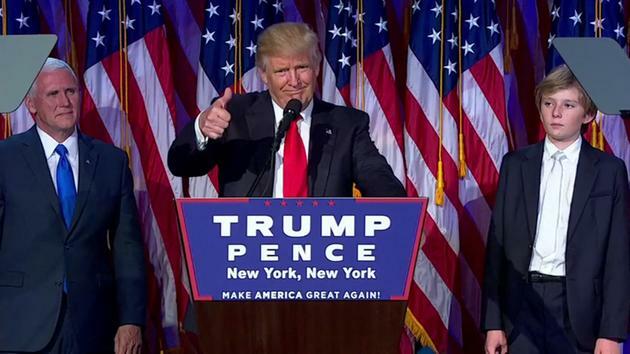 The commentators were surprised by Trump’s lead at 12:33 am on November 9th; Trump had been in the lead all night, and he had managed to keep it to this point. Fox News was also discussing how unusual it would be if Trump does get the nomination; the fact that he is a complete outsider in the realm of politics is what makes his lead so astonishing. All the Fox News reporters admitted that they thought Clinton would win, and were extremely surprised to see that she was still behind and Trump was seeming like he was going to win. They said that they thought they were going to be able to call the election at 11 pm, but at 2:17 am Wednesday morning, they still couldn’t call it. All the news networks had different numbers for the electoral votes, and they were all under the 270-vote nomination. Fox News also stated that, if Trump became president, it would be the first time since 1928, under President Coolidge, that the president and the Congress would be Republican. When President Obama became president, all of Congress was Democrat. At 2:00 am, Clinton campaign Chair John Podesta told Clinton supporters at Clinton HQ to go home since there wasn’t anything left to say until all the votes were counted. A little afterward, Trump headed to Trump HQ from Trump Tower. At 2:35 am, Google said that Trump had won the presidency. At 2:40 am, Fox News said that Trump became president after getting the electoral votes from Pennsylvania. 2016 has certainly been a historical year: the UK left the EU, then the Cubs won the World Series, and now the first outsider (who has never served in politics or the military) has won the presidential nomination. Who knows what else may happen before the year is over? Maybe Jesus will come back. Natalia is a Contributor to the Daily Runner. This is a very thoughtful piece Natalia. I am longing for Jesus to come back.